Manolo says, Ayyyyyyy! the Nicole Kidman, she is getting the Van Eyck chrome dome. This entry was posted on Tuesday, June 14th, 2005 at 1:22 am by Manolo the Shoeblogger and is filed under Ayyyyy!, Celebrity. You can follow any responses to this entry through the RSS 2.0 feed. Both comments and pings are currently closed. Ha! The Manolo, he makes the Giabella snort into her iced latte. La Tres Francaise thinks also of the forehead of the Cate Blanchett in ‘Elizabeth’……..
NK looks more like a Praying Mantis to me. The Scarlett saw NK on the Letterman last night. Ayyyyyy! The Scarlett kept finding herself muttering, “She’s nearly life-like” whenever the animatronic device would turn to the Dave and imitate way humans laugh. 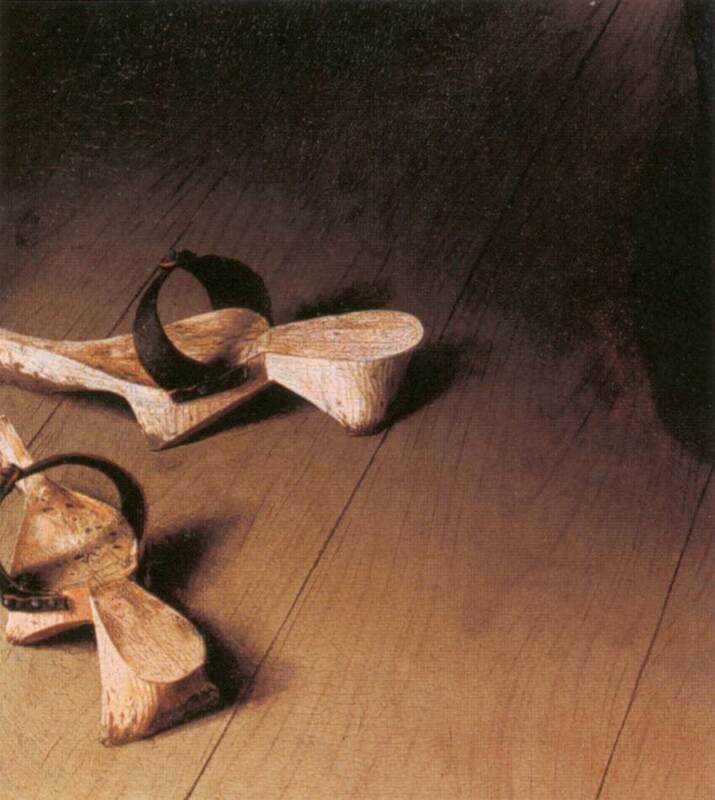 BTW, The Arnolfini Wedding is one of The Scarlett’s all time favorite paintings! Botox + Bleach Blonde = hair loss. Also, when your hair is the same color as your skin, it’s hard to tell which is which. Bless her heart. Why did she go blonde? It doesn’t work for her coloring, and she was a gorgeous redhead. Looks like she’s getting anorexia, too. EYEEEEEEEEE!!! Someone get the martian, er woman, some bangs. The shine is blinding!!!!! I can no longer see! At least a five-head. Possibly more. 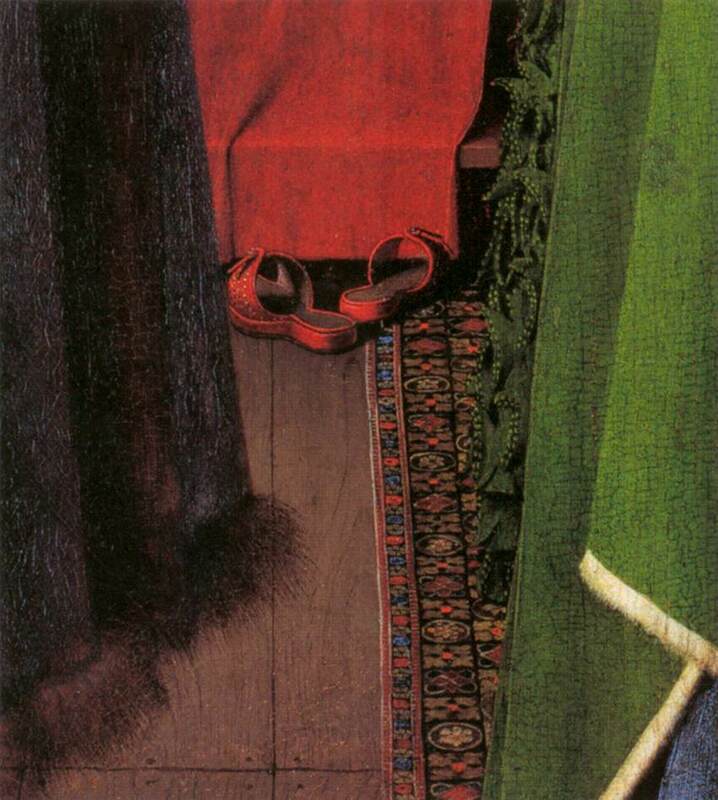 The Tia adores the 15th century version of the red slides of the Dr. Scholls (second link). haha. poor nicole. yes, the jenn, she thinks the nicole may be still somewhat not over the conspiracy that is the tom and has resorted to food restraint and botox hedonism but the jenn, she still adores the nicole. because the jenn, sometimes she wishes she had only a few inches of the nicole’s height and a few sacks of her money. Funny, I made the same observation upon viewing a picture of NK earlier this morning. Perhaps she could snack on some of those acorns she is wearing on her sinewy neck. In response to tia nieve: that first picture you linked isn’t of shoes, it’s of pattens. When you wore your lovely court slippers and needed to leave the lovely court, you slipped your pattens on over your shoes to protect them. Not sure about the red ‘slides’; they might just be super-fancy pattens. Poor Nicole, yes. Exteme thiness does not replace youth. She was a lovely girl. My forehead hurts looking at that… she looks like she’s pulled her hair too tight. The Cat, she has the very large forehead like that of the Nicole, but she has the good sense to wear the bangs with which to cover it up. I think Nicole Kidman’s large forehead is attractive. I know that most people believe it isn’t attractive on a woman, but surprisingly, this blog, nor anyone else for that matter, is the authority on what is or isn’t attractive. Attraction is very subjective, and the writer of this website may not have a large forehead of which to speak, however you can bet your sweet bippy that they have countless imperfections.